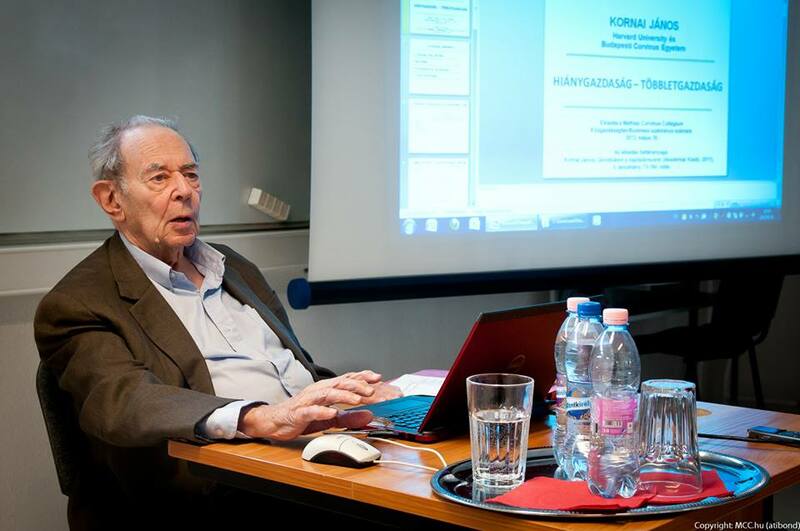 Corvinus University of Budapest has announced a course on János Kornai's oeuvre to be held in the autumn 2018 term, organised by the Department of Comparative Economics. The course will be led by head of the department Mikós Rosta, the lectures are planned to be held, among others, by János Kornai, Attila Chikán, Dóra Győrffy, Balás Hámori, Péter Mihályi, Mihály Laki, András Simonovits, Edina Berlinger, Aladár Madarász, Péter Medvegyev, János Száz, Dóra Piroska and Ágnes Vidovics-Dancs. Find more information about the course, in Hungarian, here. 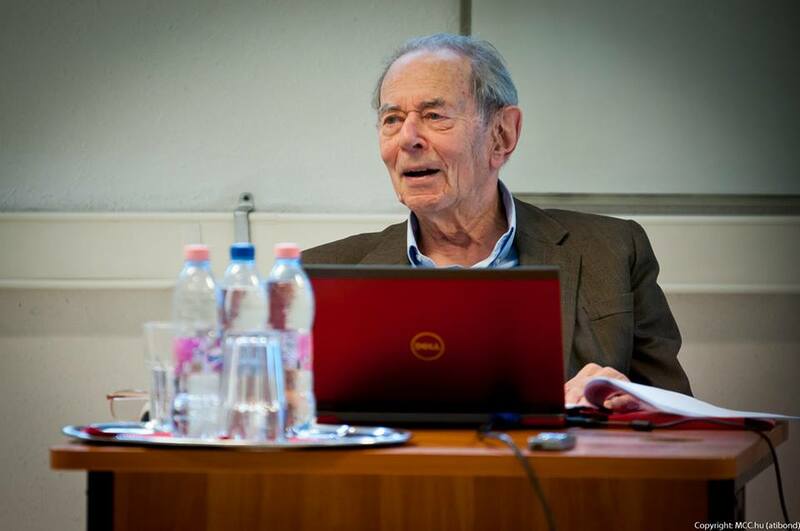 In 2018 Central European University (CEU) awarded its Open Society Prize to János Kornai. Previous awardees include Karl Popper, Vaclav Havel, Árpád Göncz, Tom Lantos, Bronislaw Geremek, Ricardo Lagos, Carla Del Ponte, Kofi Annan, Richard C. Holbrooke, Joachim Gauck and Kristalina Georgieva. Kornai received the prize at the CEU commencement ceremony on June 22, 2018. Read Michael Ignatieff's laudation and János Kornai speech in English here, in Hungarian, as published in the newspaper Élet és Irodalom, here or here. Read the news of the ceremony on the CEU site. Watch the ceremony here (its length is one hour 50 minutes, including the award ceremony between 1:30:00 and 1:42:25). Read a report on the ceremony in Hungarian here. 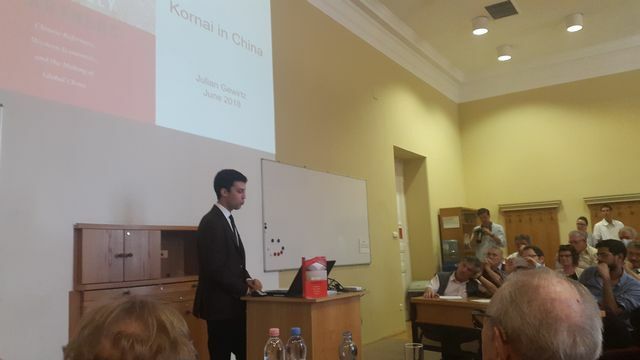 On June 5 2018, Harvard Kennedy School fellow Julian Gewirtz gave a talk on Kornai in China at Corvinus University Budapest. In his talk he discussed János Kornai's influence on the 1980s Chinese economic reform process, describing in more detail what he had written about the topic in his book Unlikely partners: Chinese reformers, Western economists and the making of global China (2016, Harvard University Press). Read more about Gewirtz on his website. Zoltán Farkas published an interview with Gewirtz after his talk, with the title "When Kornai became a celeb in China"; read it here or here (in Hungarian). On March 22 and April 12, 2018, János Kornai gave talks in the Institute of Economics, Hungarian Academy of Sciences, about the pre-1990 history of the Institute. Read the edited text in Hungarian on the Institute webpage (or here); the first talk is planned to be available soon. János Kornai had his 90th birthday on January 21, 2018. Corvinus University of Budapest (CUB) organised a series of events to celebrate it, including a workshop conference (January 18), an international conference (February 21-22), a roundtable (February 20) and an exhibition (opened on January 17). The journals Acta Economica (in English) and Köz-gazdaság (in Hungarian) published special issues on the ocassion. Harvard University organised a celebratory meeting (January 19). His friends celebrated Kornai at a special event (January 29). Find more on the series of events starting from this page. Further information about the CUB events is available here. János Kornai's new Hungarian book Látlelet: Tanulmányok a magyar állapotokról (Diagnosis: Studies on the Hungarian situation), published in November 2017, was launched in László Rajk College. The program was introduced by president of Rajk College and full professor Dr. Attila Chikán, and Péter Szauer, chairman and CEO of HVG, the publisher of the book. János Kornai discussed the book with Zoltán Farkas, a leading journalist at HVG. Find more information about the book here (in Hungarian). On September 23, 2017, leading Chinese economists organised a conference in China. The participants followed János Kornai's invited talk ("Rising populism and its harmful effects") in a video format. Read the text of the talk in Hungarian here, in English here. Academia Europaea (AE), the European Federation of Academies and Sciences (ALLEA) and the Hungarian Academy of Sciences held their joint congress in Budapest on September 5-6, 2017. Spanish economist Andreu Mas-Colell received the Erasmus Medal of the AE. The Erasmus Medal was awarded first in 1992; the first awardee was János Kornai. On the occasion of the Erasmus Medal ceremony the homepage of the host, the Hungarian Academy of Sciences, published an interview with Kornai, read it here or here. Read the speech János Kornai gave on the occasion of the 1992 award ceremony here. János Kornai writes about his memories "On the death of Kenneth J. Arrow: A personal leave-taking". Read it in English here, in Hungarian here. Early 2017 Julian Gewirtz published his book Unlikely Partners: Chinese Reformers, Western Economists, and the Making of Global China, Harvard University Press, about the influence Western economists, including János Kornai, exerted on the Chinese economy between 1976 and 1993. Gewirtz analyses Kornai’s influence, partly on the basis of the conference held on the Bashan cruise ship on the Yangtze river in 1985, partly related to ‘Kornai fever’. (Read an excerpt of the book, on Kornai fever, here.) Kornai is pictured in several of the photos in the book. In the November-December 2016 issue of Foreign Affairs Gewirtz analyses the Bashan conference, the key event in the Chinese economic transformation, in his article “The cruise that changed China.” Read the article here or download it from here. The Economist reviews Gewirtz’s book in its January 7-13 2017 issue under “Chinese economy: Western takeaway.” Kornai’s influence is commented this way: “The biggest star was Janos Kornai, a Hungarian economist who moved to Harvard after writing a seminal book in which he identified shortage as the chronic problem of socialism. What came to be called “Kornai fever” gripped the study of economics in China in the late 1980s, and his book sold more than 100,000 copies.” Read the print article here. The photo attached to the online version shows Kornai shaking hands with Premier Zhao Ziyang (available also here). In The New York Times Edward Wong introduces Gewirtz’s book in an interview “The little-known role of Western economists in building post-Mao China” in its January 25 2017 issue (read it here or here). In The Wall Street Journal Howard French reviews the book under the title “Deng’s great leap” in its January 20 2017 issue (read it here). Based on Gewirtz's book, Andrew Batson analyses Kornai fever in his blog post "The lasting influence of 'Kornai fever' in China". 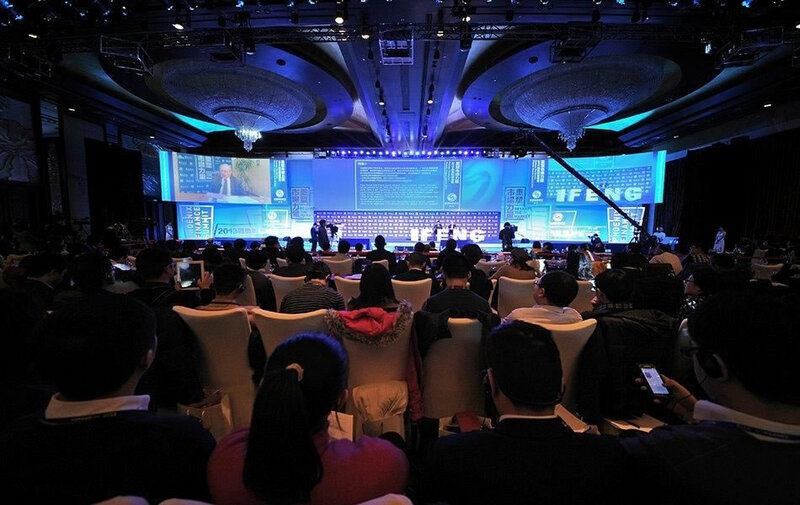 A private fund-raising foundation in China, The National Economics Foundation, has established the “China Economics Prize.” The prize is given to outstanding Chinese economists in China or abroad making great contributions in the field of economics, with works aiming to advance the theory of economics and to contribute to the development of economic thinking of mankind. The prize is honored with an equivalent of USD 300,000. The prize, on the first occasion, is awarded to Professors Yingyi Qian and Chenggang Xu. Both were János Kornai's students at Harvard University; their other doctoral advisor was Nobel Laureate Professor of Economics Eric Maskin. The award ceremony was held in Beijing on December 4th, 2016. The three economists with the most notable influence on the thinking of the two winners sent video-speeches to the ceremony: Chinese Professor Jinglian Wu, one of the most prominent intellectual leaders of the Chinese transformation, Eric Maskin (Harvard) and János Kornai (Harvard, Corvinus University). Find Kornai’s speech here. On July 5, 2016 the Department of Comparative and Institutional Economics of Corvinus University of Budapest (CUB) presented the book Constraints and Driving Forces in Economic Systems: Studies in Honour of János Kornai edited by Balázs Hámori and Miklós Rosta. The book was presented by Attila Chikán (CUB) and Mihály Laki (Institute of Economics, Hungarian Academy of Sciences). Mehrdad Vahabi (Sorbonne University) and Bernard Chavance (Université Paris) sent their video messages about the book and János Kornai’s works. Finally, Attila Chikán, László Csaba (CUB), Balázs Hámori (CUB), Mihály Laki and Miklós Rosta (CUB) discussed the book. "Elite2020: Affect rather than power" was the title of the conference on the Hungarian elite searching for its path on April 27, 2016. János Kornai sent a video message. Read its text here. János Kornai's book on capitalism, Dynamism, Rivalry and the Surplus Economy, is out in Japanese. After the Hungarian, Russian, English, Vietnamese and Polish editions, this the sixth language the book has been published, as of 2016. János Kornai, professor economics emeritus of Corvinus University of Budapest and Harvard University, has been elected to the National Academy of Sciences (NAS) of the United States of America. The official announcement was made public on May 3, 2016, after the General Assembly closed. Kornai is the first Hungarian member of the Economics section, which includes 20 Nobel laureates of its 68 American and foreign members. Corvinus University congratulated in its newsletter. The Economics Department of Harvard University sent its congratulations on its website to the newly elected two members, Oliver Hart and János Kornai. 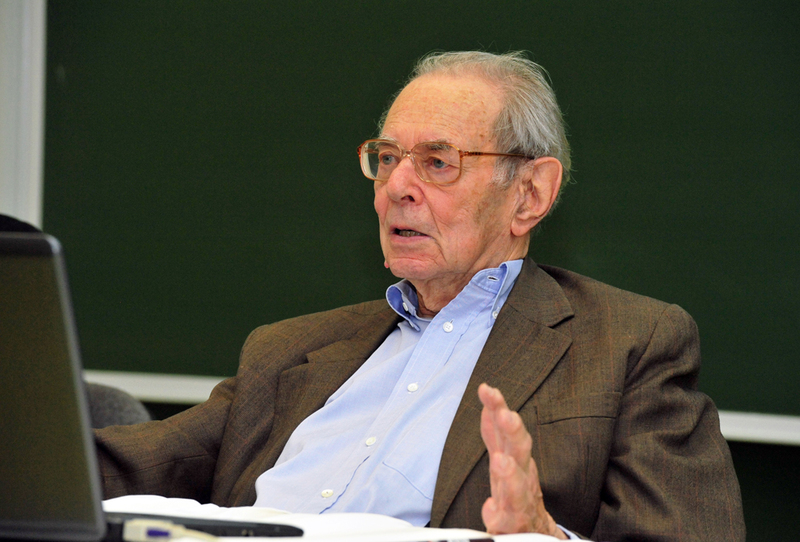 The volume Constraints and Driving Forces in Economic Systems: Studies in Honour of János Kornai, edited by Balázs Hámori and Miklós Rosta, is just out, containing English language papers written on the basis of conference talks at an international conference to celebrate János Kornai’s 85th birthday. The authors are Balázs Hámori, Csaba László, Karen N. Eggleston, Gérard Roland, Katalin Szabó, Péter Mihályi, Gábor Klaniczay, Dóra Győrffy, András Simonovits, Miklós Rosta and Eszter Rékasi. Find more information about the book here. In 2011 the Kalligram Publishing House started to publish The Selected Works of János Kornai. Four volumes have appeared so far: two monographs, The Economics of Shortage (2011) and The Socialist System (2012), and two edited volumes of Kornai's papers, Centralization and Market Reform (2013) and The Soft Budget Constraint (2014). The original plan targeted six more volumes. János Kornai decided to discontinue the series. The preparation of each volume put a considerable burden on Kornai, who was also the editor of the volumes. He now decided to focus his energies on new works, and not re-publishing previous ones. WINIR (World Interdisciplinary Network for Institutional Research), the international interdisciplinary network of institutional research has been established. Its inaugural congress was held in Greenwich between September 11-14, 2014. Among other analysts of intitutional research, János Kornai was elected honorary president of WINIR. At the congress a separate Kornai-section was devoted to János Kornai's works. There the first talk was given by Kornai on his book Dynamism, Rivalry, and the Surplus Economy (see the slides here), followed by Prof. Klaus Nielsen (Birbeck College, University of London) and Prof. Mario Nuti (Universita di Roma, "La Sapienza"). EACES (the European Association of Comparative Economic Studies) held its biennial conference at Corvinus University of Budapest between the 4th and 6th of September 2014. János Kornai held one of the keynote talks on 'Dynamism, rivalry and the surplus economy.' Find the slides here. More on the conference: here. On May 14, 2014 the Japanese daily Asahi Shimbun published an interview with János Kornai by Keiko Joshioka. Read the interview here. The Peterson Institute for International Relations (USA) and the School of Public Policy at the Central European University (Hungary) convened a conference on Transition in Perspective: 25 Years after the Fall of Communism in Budapest, on May 6 and 7, 2014. The conference was attended by Leszek Balcerowicz, Václav Klaus, Anatoly Chubais, and many other well-known economic policy-makers and academic economists of the postsocialist transition period. The keynote lecture at the dinner of the conference was delivered by János Kornai. Find the text of the lecture here. The Hungarian translation is here. Find out more about the conference here. János Kornai's memoirs By Force of Thought has been published by the Harmattan publishing house in French. Its title is À la force de la pensée: Autobiographie irrégulière. The book was translated byJudith and Pierre Karinthy, and edited by Bernard Chavance. Find more information about the book here. 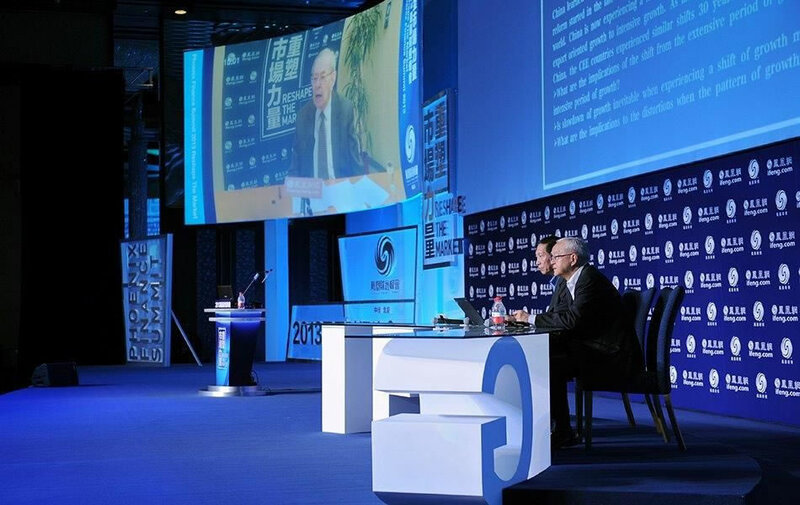 Kornai at the Chinese "economic summit"
In Beijing on December 26-27 2013 the Phoenix TV company convened an "economic summit" including several well-known Chinese economists and political economists. János Kornai was invited to speak. As Kornai could not travel, the organizers arranged a "tele-talk" for the final plenary meeting. 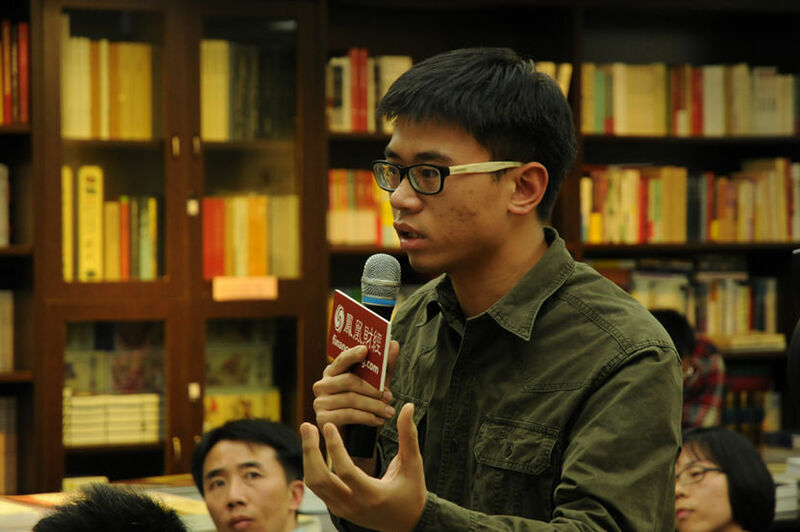 The questions of the moderator, Professor Chengang XU (Hongkong University), were answered first by Kornai and then by Professor Jinglian WU (Chinese Academy of Social Sciences), one of the major architects of the Chinese economic reform. Professors Xu and Wu were sitting on the stage, and Kornai's contributions in English, recorded in a Budapest studio and simultaneously interpreted to Chinese, were broadcast live for the conference participants. China's pressing problems were discussed: the visible slow-down of growth, the economic and social tensions, the growing income inequalities and the possibilities of political reform leading to democracy. A detailed report on the plenary meeting was re-posted on many online sites. A few days after the conference the report was found to have been read by over two million readers. 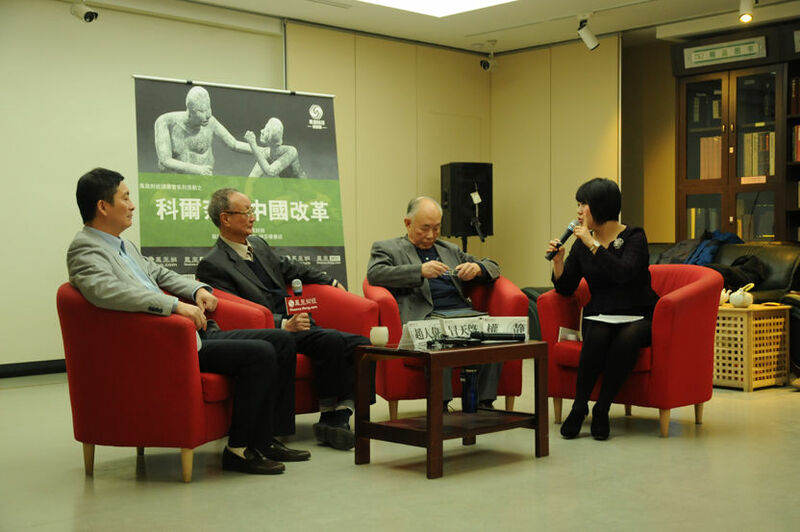 On December 8, 2013 a discussion forum was organized on János Kornai’s memoirs in Beijing. (The book had been first published in 2009 in Hong Kong in traditional characters. In 2013 it was re-published, this time in Shanghai, in simplified characters.) The discussion forum was broadcast by the finance club of the Phoenix TV, one of the popular programs of the TV channel. Participants on the stage were the following (from left to right in the leftmost picture below): Professor Yijiang WANG (Doctoral School, Cheung Kong Business School), Professor Renwei ZHAO (former director of the Institute of Economics, Chinese Academy of Social Sciences), Professor Tiangi MAO (senior fellow of the Institute of Economics, Chinese Academy of Social Sciences) and hostess of the programme Jing QUAN. The audience were mainly young people. The program announcement is here, the recording of the program and further information is available here. In early December, 2013 János Kornai made an announcement: he would be glad to consult three doctoral students in their research. The cooperation will be preceded by a selection procedure -- details and the selection criteria are available on the department homepage. The deadline is January 31, 2014. 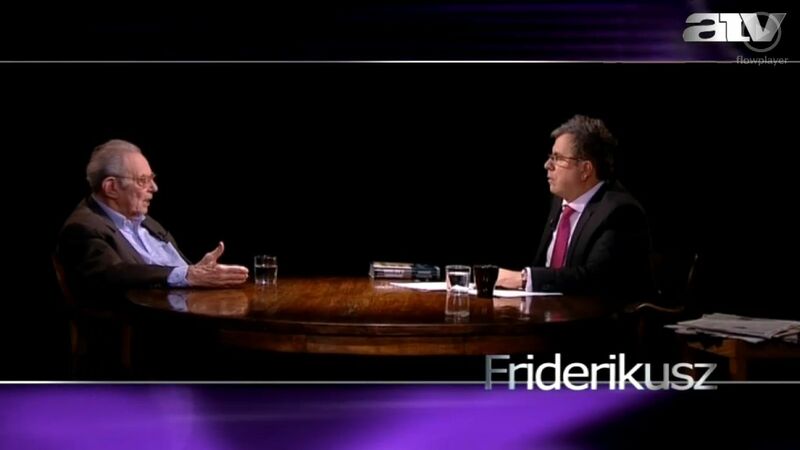 Sándor Friderikusz interviewed János Kornai in his program at the ATV television channel on December 3, 2013 (watch it here). At the end Friderikusz said: "we have covered maximum half of the topics I collected to be discussed," and asked Kornai to continue the interview the following day. The December 4 second part is available here. The Galamus-group published the transcript of the Kornai-Friderikusz interview in two parts, here (December 3) and here (December 4). (The transcription was made by Ádám Kerényi.) The transcript is also available here. 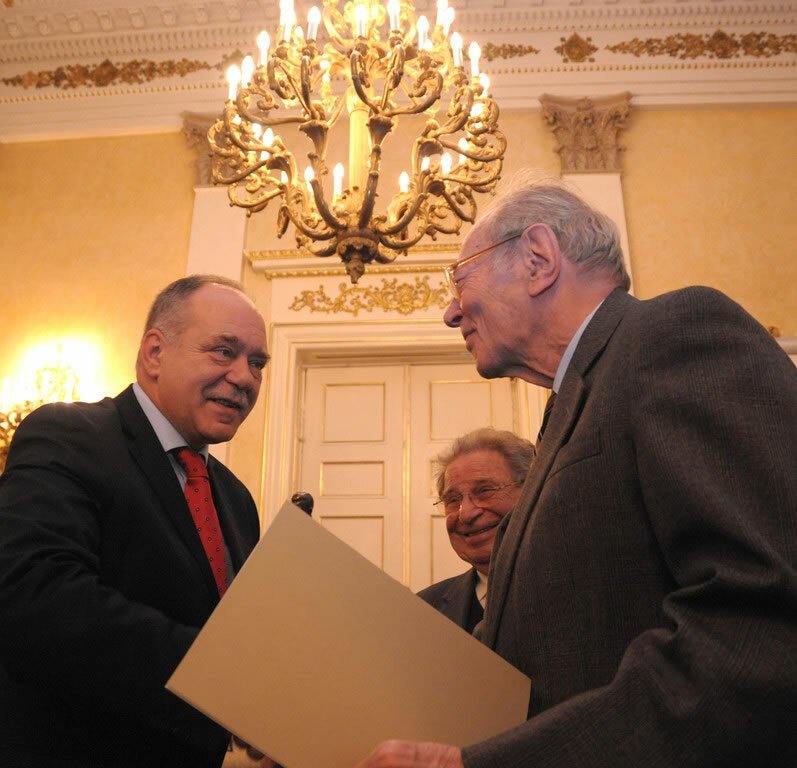 In November 9, 2013 János Kornai received the Hazám Prize ('My country', named after an Attila József poem). Read about the details here (in Hungarian). On September 28, 2013 the Hungarian Institute of the Babeș-Bolyai University's Faculty of Economics (Kolozsvár / Cluj) organized an “Economics Alumni Evening”, inviting alumni of the Institute. 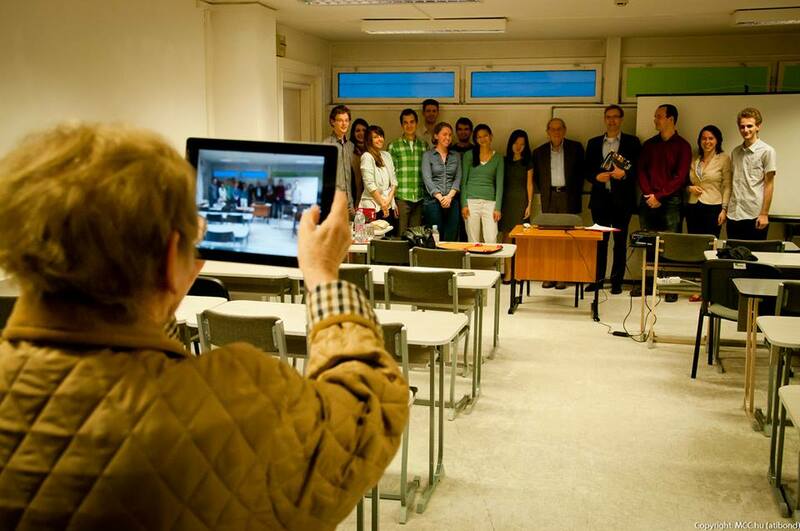 The organizers interviewed János Kornai in Budapest (sitting at his own desk) through Skype about the higher education reform, projecting the live interview. First the moderator, assistant lecturer Ildikó Kovács asked questions, followed by the participants. A report of the event is available here. SESS, the Association of European Doctoral Schools in Socio-Economic and Statistical Studies, had its annual conference in Budapest. 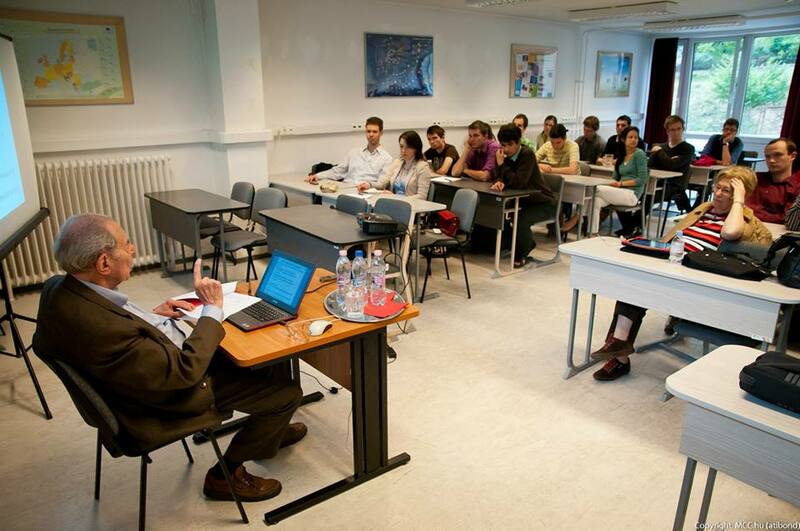 The keynote lecture, 'Shortage economy - Surplus economy', was held by János Kornai on September 9, 2013. Find the slides here. After the 2009 Hong Kond edition in traditional characters, János Kornai's memoirs By Force of Thought is now published in simplified characters in Shanghai. This is the 10th edition, after the Hungarian, English, Japanese, Russian, Polish, Vietnamese, Chinese (traditional characters), German and Slovak edition. Read more details here. On June 5, 2013 the conference of the Faculty of Social Sciences at the Budapest University of Technology started with János Kornai's talk. The slides are available here. On May 30, 2013 János Kornai gave a talk on 'Shortage economy -- surplus economy' at the Mathias Corvinus Collegium. On April 5, 2013 János Kornai gave a plenary talk on the soft budget constraint at the conference organized by the Faculty of Law of Pázmány Péter Catholic University. The slides are available here. 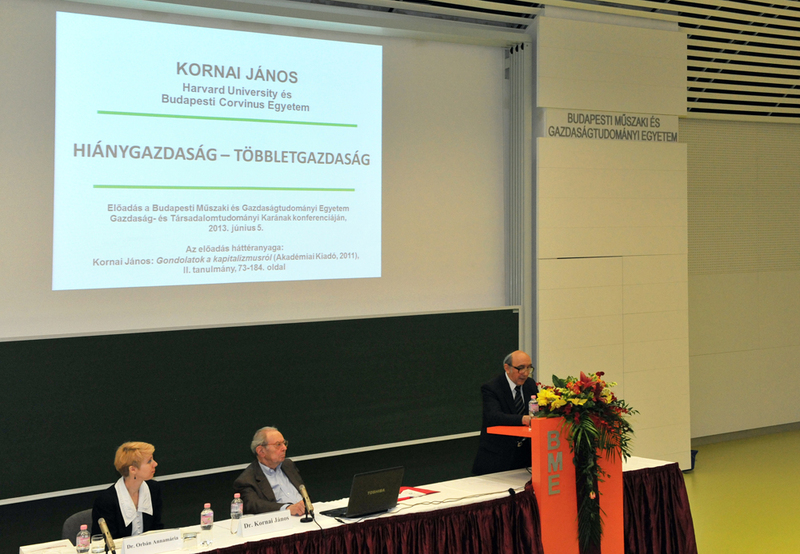 On April 25, 2013 Corvinus University of Budapest and the Kalligram Publishing House launched Központosítás és piaci reform (Centralization and Market Reform), the third volume of János Kornai's ten-volume selected works. The event was opened by Vice Rector Zoltán Szántó, followed by talks by Mihály Laki and András Simonovits, academy doctors of economics, and János Kornai. The book launch was hosted by Sándor Mészáros, chief editor of the publishing house. This was the poster of the book launch. Központosítás és piaci reform (Centralization and Market Reform), the third volume of János Kornai's ten-volume selected works is now published by the Kalligram Publishing House. While the first two volumes, A hiány (The Economics of Shortage, 2011) and A szocialista rendszer (The Socialist System, 2012) are two monographs by Kornai, this volumes is a collection of papers on the above topic. More information on the volume is available here, the table of contents is here. On February 8, 2013 János Kornai was awarded the Honorary Doctorate of the Pan-European University, Bratislava, Slovakia. The ceremony was held at the beginning of the conference on 20 Years of Economic Reforms in Central and Eastern Europe, followed by Kornai's plenary talk. János Kornai was 85 years old on January 21, 2013. Corvinus University of Budapest, in co-operation with the Central European University and the Hungarian National Bank, organised a full-day conference on January 18, where his friends, colleagues, past and present students celebrated him. Corvinus University Rector Zsolt Rostoványi presented him the Silver Corvina award. More on the conference here. Colleagues celebrated the birthday beyond the conference. Péter Gedeon (Corvinus University of Budapest) published a paper 'From Anti-equilibrium to The socialist system and beyond'' for Kornai's birthday. It is available here in English, here in Hungarian. As the second volume of the Kalligram Publishing House's ten-volume selected works of János Kornai A szocialista rendszer (The Socialist System) is now available. The book was launched on June 12, 2012 in the bookshop 'Írók Boltja' where historian János Rainer M. talked to Kornai about the book. On June 29, 2012, János Kornai gave a talk on „Breaking promises” at a conference on the „Economic culture of modern capitalism” held in St. Petersburg, Russia. The conference hosted the book launch of the Russian edition of Kornai’s new book Размышления о капитализме (Thoughts about Capitalism), introduced by professors Andrei Zaostrovtsev and Natalia Drozdova. The book was published jointly by the Smolny Institute (St. Petersburg) and the Gaidar Institute (Moscow), translated by Oxana Yakimenko. On December 14, 2011 the Kalligram Publishing House launched János Kornai's re-published work A hiány (The Economics of Shortage). At the book launch, hosted by Corvinus University of Budapest Rector Tamás Mészáros, the book was introduced by László Szigeti (head of Kalligram), Balázs Hámori (professor, department head at Corvinus), and János Kornai. The book, originally published in 1980, is the first volume of the ten-volume selected works of Kornai to be published by Kalligram. János Kornai's memoirs By Force of Thought has been published by Kalligram. The book was launched in Pozsony / Bratislava on November 15, 2011 by renowned Slovakian economists: Slovakian finance minister Ivan Miklós, Central European University Budapest Professor Julius Horváth, and Brunel University London Professor Jan Fidrmuc. Slovak is the ninth language of publication for Kornai's memoirs, following the Hungarian, English, Japanese, Russian, Polish, Vietnamese, Chinese and German editions. Invited by Corvinus University of Budapest, János Kornai started to work there as of August 1, 2011. He is going to continue his research and also to teach there as honorary professor emeritus. In the fall term of the 2011-2012 academic year he has announced a six-talk course on Gondolatok a kapitalizmusról (Thoughts about capitalism) at the Department of Comparative Economics. In the June issue of Baltic Worlds an interview "24 hours is a long time in revolutions: János Kornai on taking risks and ending up on opposing sides" can be read here. On its June 30, 2011 assembly meeting Collegium Budapest Institute for Advanced Study Association decided to terminate the activities of the Institute. János Kornai had been one of the founders of Collegium Budapest, who first as a Permanent Fellow, later, 2003 on as a Permanent Fellow Emeritus worked for the Institute, from the preparations on its foundation until the resolution on its termination. János Kornai's new Hungarian collection of papers Gondolatok a kapitalizmusról (Thoughts about capitalism) is out (Akadémiai Kiadó, 2011). Corvinus University of Budapest has awarded János Kornai the title of “Honorary Professor Emeritus.” The certificate was presented by Rector Tamás Mészáros at the opening plenary session of the April 26 conference of the Faculty of Economics of the university. Read János Kornai's talk in Hungarian here. In a recently published book of interviews dicussing the European situation and problems of mainstream challenging "heterodox" schools in economics (Rosser, J. Barkley – Richard P. F. Holt – David Collander (eds. ), European Economics at a Crossroads, 2010. Cheltenham: Edward Elgar), the editors asked two scholars, Nobel laureate German professor Richard Selten and János Kornai, to overview and evaluate the interviews. The Kornai interview is available here. In the September 2010 issue of the journal Mozgó Világ Zoltán Farkas published a detailed analysis on the influence János Kornai's works and his book By Force of Thought exerted in China. The article A kínai kapcsolat ('The Chinese connection') presents the effect of Kornai's works published in China in a chronological order, in their relationship to current Chinese internal political affairs, with the help of reviews, memoirs and other matierials published there, including a television program and the discussion of two Chinese dissidents. Traditionally, on March 15 (a national holiday in Hungary) the President of Hungary presents state orders of merit in the Parliament building. In 2010 János Kornai was presented the highest Hungarian state order, the Grand Cross of the Order of Merit of the Republic of Hungary. According to the official laudation, he was awarded "for his works and world-wide recognized research results on the theory and behavior of economic systems". János Kornai was awarded the Leontief Prize, named after Nobel Laureate American economist of Russian origin Vassili Leontief, the creator of the input-output analysis. The Prize is presented annually to several Russian and one international economist by the Leontief Center in St. Petersburg, Russia, on the basis of the recommendation of an international committee. 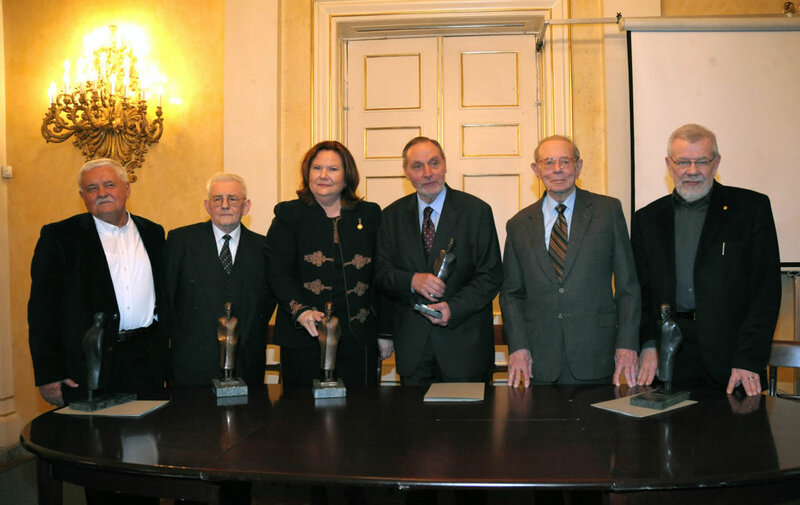 Earlier awardees include the late Yegor Gaidar, earlier Russian prime minister, American Nobel Laureates Robert Solow and Lawrence Klein, and Leszek Balcerowicz, the first Polish finance minister after the transition. Professor Jinglian Wu is regarded the most notable and influential economist in the Republic of China. On January 26-27, 2010 his friends, students and colleagues organized a conference to celebrate him on his 80th birthday. They invited János Kornai to participate and give a talk at the conference. Due to issues of health, Kornai could not travel, but he sent his celebrating words in a video message. 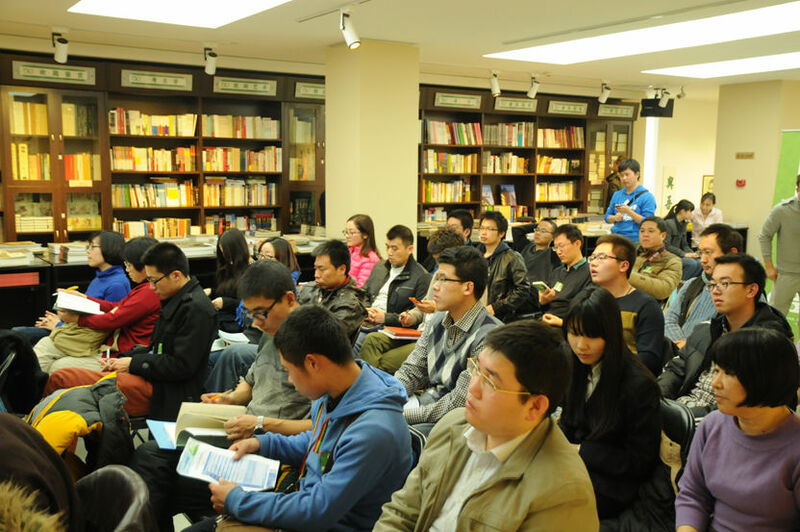 The talk he prepared was presented by his Harvard student, Professor Chenggang Xu (Hong Kong University). Kornai's talk was commented by Professor Masahiko Aoki (Stanford University, President of the International Economic Association) and Professor Yingyi Qian (Tsinghua University), the dean of the Faculty of Economics of the most prestigeous Chinese university. You can find the report sent by the organizers to Kornai. Reviews on János Kornai's memoir By Force of Thought are available here. From among the numerous reviews let us draw your attention to a few particularly remarkable ones, recently received from China (by Suli Liu - Yuegang Lu), Russia (by Dmitri Travin, in Russian) and India (by Deena Khatkhate, commented by Chattopadhyay). John P. Bonin (2009): From Socialism to Capitalism: Eight Essays. By János Kornai. Journal of Economic Literature 47/3: 853-856. Read it here. On December 5, 2005 János Kornai gave a lecture on Közép-Kelet-Európa nagy átalakulása - Sikerek és csalódások" (The Great Transformation of Central and East Europe: Success and disappointment) at the Mindentudás Egyeteme ('University of Omniscience', a highly popular lecture series also broadcast by the Hungarian public television). You can watch the talk below. The link also includes a transcript of the talk and the Q&A session with the audience, together with the accompanying slides (all in Hungarian).